This post contains affiliate links. If you purchase something from these links I may receive a small percentage of the sale at no cost to you. A big thanks to Battle of the Stitches and Battle Fans! This design was the Judge’s Choice Winner AND the Fans Choice for Round 2! To learn more about Battle of the Stitches visit THIS website. Like to print your patterns? No problem! For you convenience there is a handy PDF you can purchase. 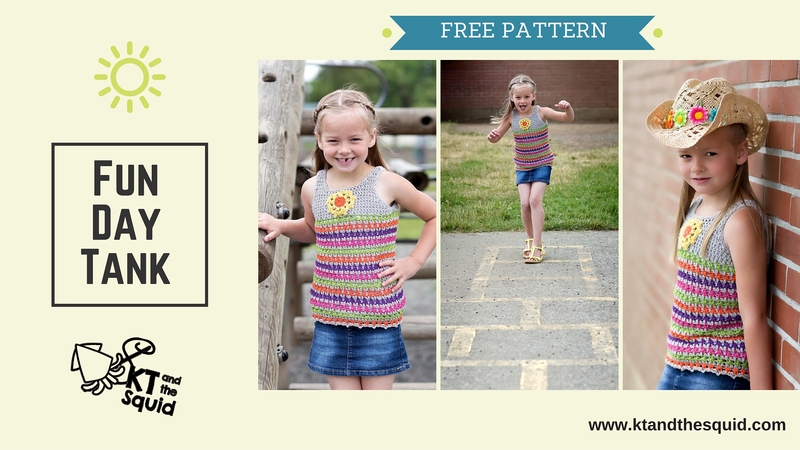 Of course you can always just scroll down for the free pattern. Save time and check your gauge! Extended Single Crochet (esc): Insert hook into st indicated, pull up a loop, yarn over, pull through 1 loop on hook, yarn over, pull through 2 loops on hook. Triangle: Yarn over, insert hook into first st indicated, pull up a loop, (yarn over, insert hook into next st, pull up a loop) twice, yarn over pull through all 7 loops on the hook. Picot: Ch 3, ss into the 3rd ch from hook. This top is worked in one piece with little seaming at the shoulders. You will start by working in the round from the bottom up. You will then work the back, then the front, seam the shoulders together and add the trim. This pattern is based off standard sizes. Carry the MC throughout (do not fasten off). If you are only using 1 CC you can carry it as well. If you are using more than one CC fasten off when changing colors. The ch 2 at the beginning of a round or row counts as an esc. With MC loosely ch 76(80, 88, 92, 96), being careful not to twist, join to the first ch. Repeat round 2 and 3, 11(12, 14, 15, 16) more times. You will have 25(27, 31, 33, 35) total rounds. *You will now split for the arm holes and start working in rows. Return to the last row before the split for the neck, skip 14(16, 18, 18, 20) sts, join with MC. Return to the last round of the bottom, skip 2(2, 3, 3, 3), join with MC to the next unworked st.
Last row (shoulder seam) – With wrong side facing ss the 4(4, 4, 5, 5) sts of this last row to the corresponding 4(4, 4, 5, 5) sts of the last row of the back, fasten off. Return to the last row before the split for the neck, skip 8(10, 12, 12, 14) sts, join with MC. With CC join to the first ch of the foundation ch on the bottom of the top. You will now work into the unworked sts of the foundation ch. With MC join to any st at the neck. Round 1 – Ch 1, sc evenly around, join, fasten off. With MC join to any st at the arm. Repeat just as you did for the neck, repeat on the other side, fasten off. Sew applique onto the front middle of the top. You may find it helpful to pin the applique in place. Block, weave in all ends.